Last week we broke down what the RBA, BOC, and ECB had to say. Are the SNB and BOE’s monetary policy decisions as enlightening as last week’s announcements? As many had expected, the SNB kept its main rates steady for another month. Interest on sight deposits is still at -0.75%, while the three-month LIBOR remains at a range of -1.25% to -0.25%. However, the central bank still believes that the franc is “highly valued” and that “the situation on the foreign exchange market is still fragile.” It still sees currency its negative rates and currency intervention as “necessary” to reduce the franc’s attractiveness. Thomas Jordan and his team were generally upbeat about the economy. They continue to expect “moderate recovery” thanks to exports growth helping industrial activity and investments while the labour market is expected to maintain its “gradual” improvements. Despite that, the SNB lowered its 2017 GDP forecast from 1.5% in June to 1.0%. Apparently, the strong growth prospects are not enough to prop up the weak momentum from late 2016/early 2017 quarters. 2019 inflation is revised higher from 1.0% to 1.1%. 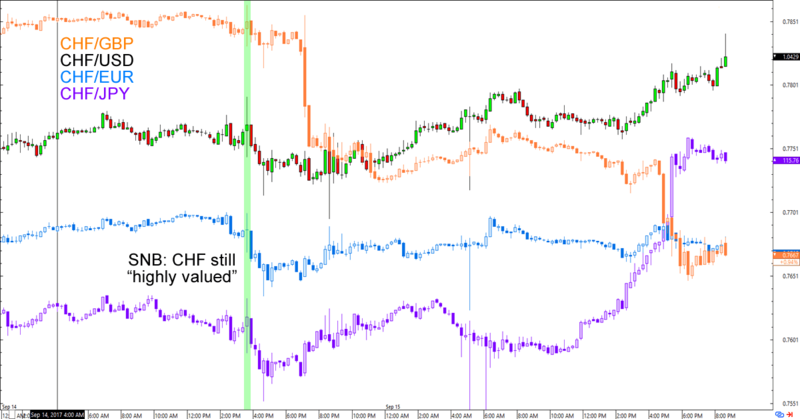 The SNB letting go of its “overvalued” rhetoric initially sent the franc higher, but profit-taking ahead of the BOE and U.S. CPI events, as well as other traders pricing in the “highly valued” warnings dragged it back down for the rest of the early London session. Much like the SNB, the BOE’s Monetary Policy Committee (MPC) made no changes to its policies in September. Interest rates is till at 0.25% after a 7-2 vote, while stocks of corporate bonds and government bonds purchased are maintained – by unanimous decisions – at £10B and £435B respectively. “Immediate tightening” in the works? Remember that the BOE had been shying away from raising its interest rates because it believes that stimulating growth and employment is more important than limiting inflation to its 2.0% target. But what if growth and employment prospects are already looking up and inflation is rising faster than expected? BOE noted that Q2 2017 growth is in line with its August Inflation Report (AIR), though household consumption was dragged by lower car sales due to higher excise duties implemented in April. Business investment and net trade were also weaker than expected in the Inflation Report. Things are looking up, however. MPC noted that other surveys actually point to strong trading activities in Q3 2017. Early indicators are also signalling consumption and business investment growth that are stronger than expected in the Inflation Report. In fact, they could even push Q3 GDP even higher especially if the MPC’s indicators are right about net trade activities (and their contribution to GDP) picking up. BOE was also pretty happy about the labour market, saying that indicators suggest “continued strength in employment growth” as indicators point to “continued erosion of what is now a fairly limited degree of spare capacity.” Pay growth is expected to remain modest, though. Last but not the least are headline and core inflation numbers, which both grew faster than the Inflation Report suggested. BOE now expects headline inflation to rise ABOVE 3.0% in October instead of merely hitting the mark next month. With growth expected to pick up, inflation projected to accelerate, and the labour market expected to keep calm and carry on, it’s no wonder some members already want to tighten the BOE’s policies. “The August projections implied that the economy was expected to operate with a small degree of spare capacity through most of the forecast period, justifying the tolerance of some degree of above-target inflation. SOME members think that developments have “strengthened the case for an immediate tightening in monetary policy.” This would also have the added benefit of not needing a more abrupt policy change should inflation accelerate. 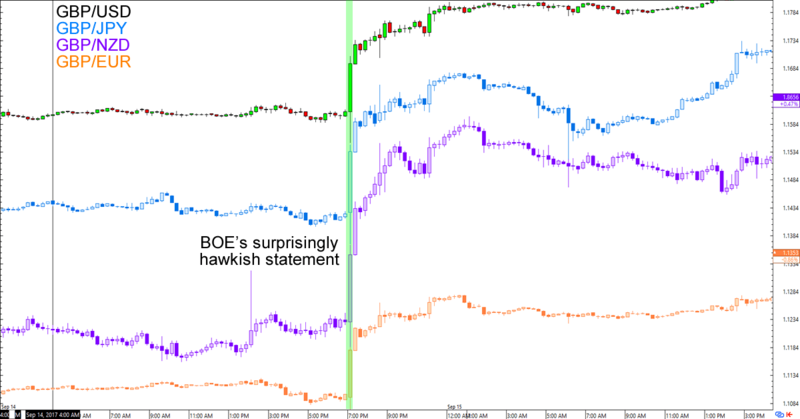 Not surprisingly, the unquestionably (and unexpectedly) hawkish statement boosted the pound higher against its major counterparts. In fact, the currency barely saw retracements before Asian session traders jumped in to extend the pound’s trends.